It’s that time of year again, when consumer goods grow on the curb and around dumpsters as if by magic, all sitting there just ripe for the picking. In other words: the leases downtown are almost up, university students suddenly realize they have no desire to move all their crap with them, and they end up throwing perfectly good stuff out as trash: clothing, electronics, unopened boxes of food, furniture, books, cleaning supplies, wadded up $20 bills — if you can name it, it’s probably been thrown away. Among many of those in my city who don’t move in August, it’s become an annual tradition to stroll around downtown, gleaning the discarded fruits of other people’s lives. The harvest period begins around August 1. By August 13, it’s so bountiful the pickers can’t possibly keep up, although they try. By August 15, the harvest is all gone — carried away by garbage gleaners as well as the more traditional garbage trucks. My friend Dekalb and I went out today to see what we could find. We’ve been gleaning together for years. Besides crates, there’s a pizza oven, lots of clothes, laundry detergent, a coffee grinder, Keurig coffee pods, and a bazillion other things too numerous to mention. 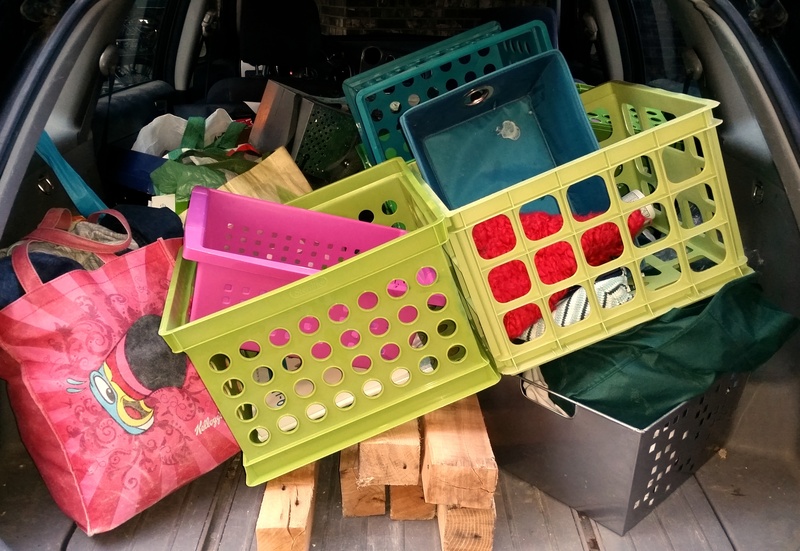 Dekalb plans to use the crates for organizing his workshop — a never-ending task. The wood underneath is oak from construction pallets that someone threw in a dumpster. We’ll run some of the pieces through a table saw to make new legs for a loveseat I have that’s too short. There’s a pizza oven in there, too, and lots of clothes, laundry detergent, a coffee grinder, and Keurig coffee pods. 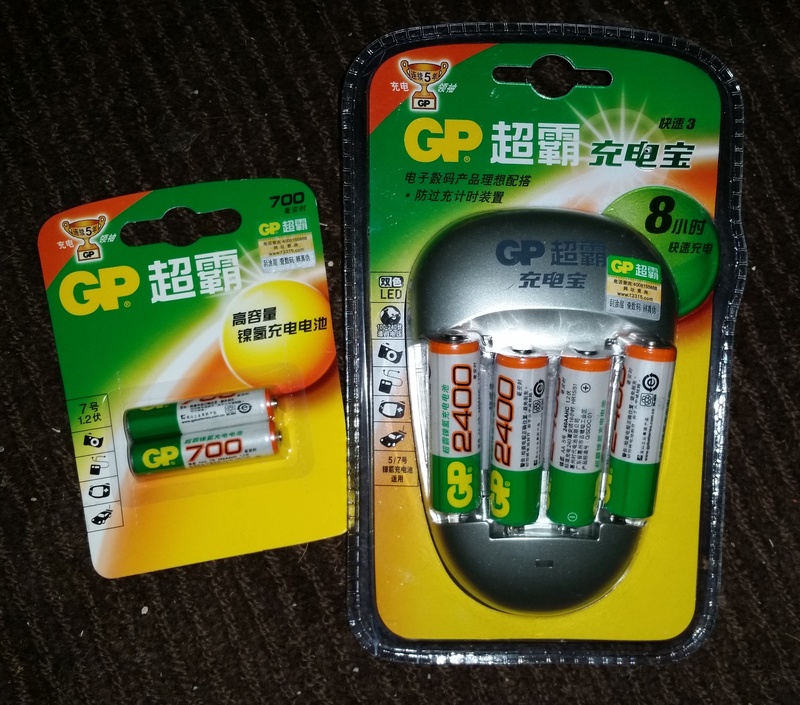 These batteries traveled a long way just to end up in the garbage. When I got home, Lilo had to inspect everything. 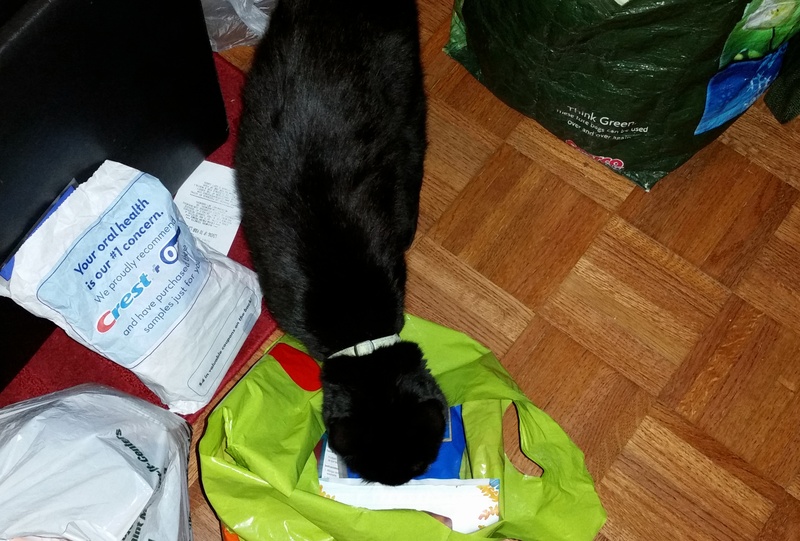 The bag of sample-size toothpastes and dental flosses intrigued her. And so did the coffee. But she had no idea what to make of the pizza oven. I’m not sure what to make of it yet, either. I need to clean the crumbs out and test it to see if it works, then decide whether to keep it. It would be nice to have a way to make pizza in the summer without getting the kitchen as insufferably hot as my built-in oven does … but it would be another gadget to take up space, so there’s that to consider. Lilo checks out the pizza oven. We don’t keep everything we find. A lot of it goes to the charity thrift store – some of it needs a little cleaning first, but a lot of it is pristine and can be delivered directly there. We takes bags and bags of unopened, non-perishable food to the food pantry. 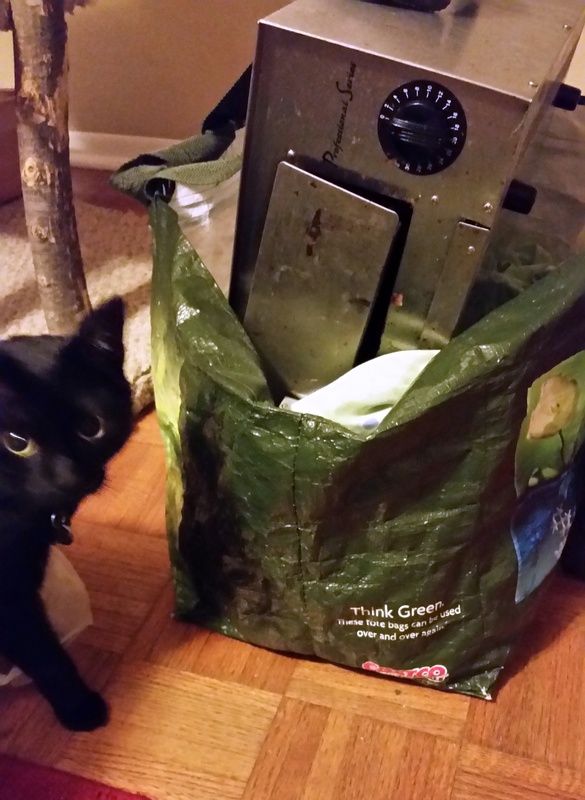 Garbage picking is the ultimate in upcycling. It transforms trash into useful items – and the only thing required to make the transformation is the simple act of removing it from the garbage.